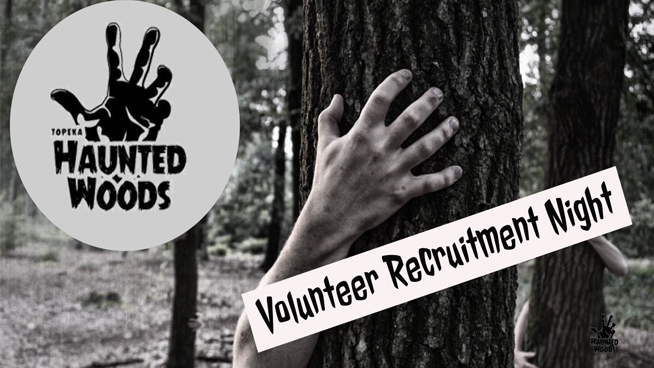 A scary and fun volunteer opportunity awaits you at this year’s edition of Topeka Haunted Woods. For the second year in a row, The Forest Park Conference Center will hold it’s haunted Woods scare attraction on the grounds. It’s a half-mile hike through frightful woods, hills and manufactured scares. You probably already know that it’s pure delight for fans of horror, zombies and just plain fun, but you may not realize that most of the ‘scare actors’ are volunteers. In fact, even the ticket takers, food servers, and security are mostly volunteer workers. Needless to say that takes a herculean effort on the part of the park’s Event Coordinator, Mark Arganbright and his Volunteer Organizer, Tracy Cass. The full October weekend operation is a fundraiser for the Non-Profit park and camp that provides opportunities for enrichment to Boy and Girl Scouts alike, along with providing summer food programs for at risk children. That’s why they’ve put together a campaign to round up volunteers for this year’s attraction. Along with folks who want just spook the heck out of people, they’re looking for all around volunteers, people who can be quickly trained for a variety of responsibilities, like line-up helpers, ticket takers, parking direction and much more. You can find out everything you need to know this Tuesday September 4th by attending a Volunteer Recruitment and Orientation Night at Forest Park Conference Center. No need to sign up or pre-register, just show up no later than 7pm, Tuesday September 4th at the Dining Hall.